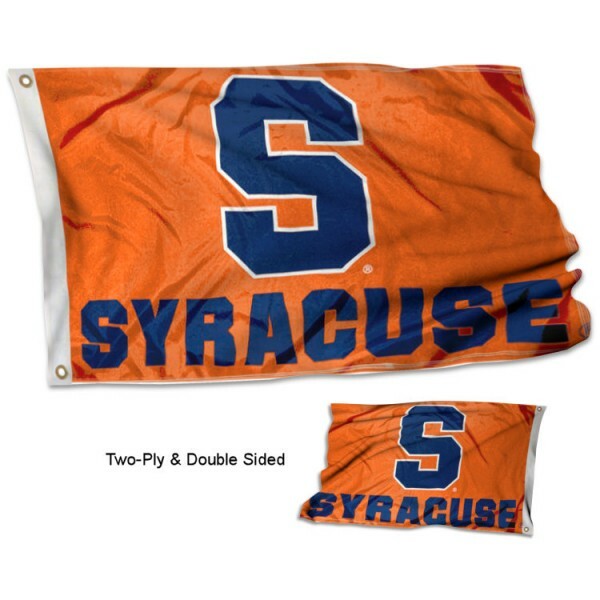 Our Syracuse Orange Stadium Flag measures 3'x5', is constructed of 2-ply polyester, has quadruple-stitched fly ends, and has double-sided screen printed insignias. Also, this Syracuse Orange Stadium Flag has a liner sewn between its 2 sides to eliminate sunlight distortion of the logos thereby allowing them to be viewable and readable correctly on both sides. Our Syracuse Orange Stadium Flag is the official flag flown over the College Football Hall of Fame and from stadiums and arenas across the country. Fly your Syracuse Orange Stadium Flag with our tailgate flagpole or 6' aluminum flagpole and adjustable flag bracket.